Recently my friend, Donna announced a cooking challenge in her foodie group "Kuch Khatta, Kuch Meetha, Kuch Teekha "[KKKMKT]. Challenge was to prepare a cake without the use of white flour, white sugar and eggs. I had attempted cake recipes that would go with this theme but then I had already posted those recipes on her group and they were Eggless Ragi Banana Cake, Green Moong Savoury Cake and Eggless Savoury Semolina Cake. 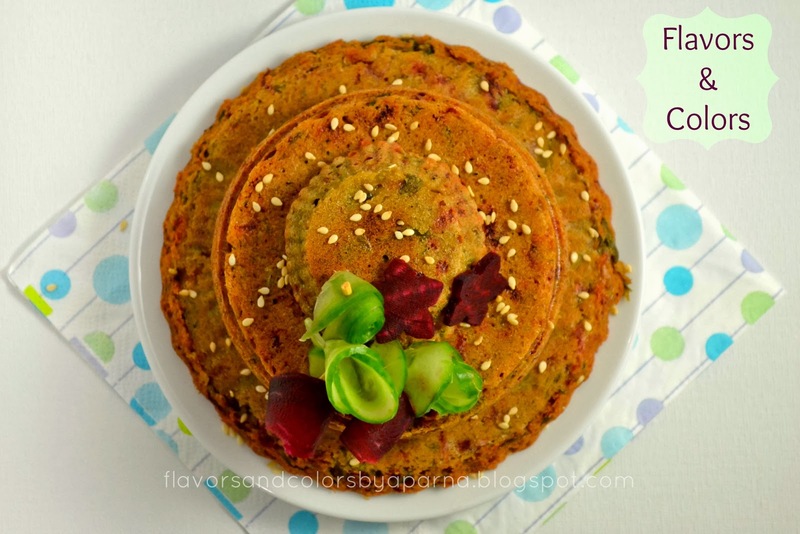 Moreover, I wanted to try something with oats flour and this led to my search for its recipe that would fit into this theme. After browsing through different recipes [which made me realize I have to attempt many similar recipes for a nutritious cake], I zeroed down to Oats Carrot Savoury muffins recipe from Divya's culinary journey and decided to adapt her recipe. 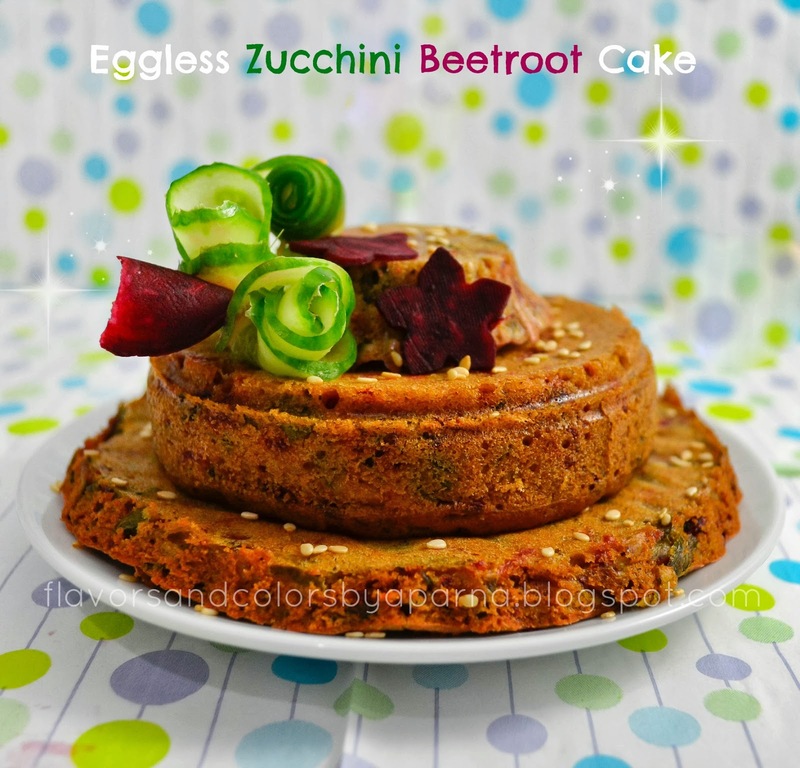 I made use of zucchini and beetroot together instead of carrots as I didn't have them at that time. I baked them in different cake pans as well as muffin molds and hence you see those three layers ! Thanks Donna for this wonderful theme that gave me a great chance to try out this recipe. Grease cake tins/ muffin molds and dust it with flour. Preheat the oven to 190 degrees C. Wash, clean cucumber, beetroot and grate it. Squeeze to remove excess moisture and keep them aside. Roast oats for 2 mins on low flame, allow it to cool and later grind it into fine powder. Measure 1/4 cup of oats powder and keep it aside. In a bowl, mix wheat flour, oats flour, baking powder, baking soda, dry ginger powder, cumin powder, pepper powder and salt. Now make a well in the centre of this mixture and add yogurt, milk and oil, one by one. Finally add grated cucumber, grated beetroot and finely chopped mint leaves [u can also use coriander leaves as mentioned in original recipe]. Mix everything nicely taking care no lumps are there in the batter. Pour this batter into greased pans/ molds and bake it for 25-30 minutes [Oven timings may vary]. Take it out of the oven and allow it to cool on wire rack. Garnish with toasted sesame seeds [optional] and serve it as tea time snack. The cake texture was dense and moist from inside. It didn't rise much as it does with all purpose flour/cake flour. To get better feel of the texture and how oats flour bake up, I need to experiment with this flour more. The last pic is clicked in natural day light where as first two pics are clicked at night time with help of DIY light box :), that's why you see the difference in lighting between those pics. Hey what a healthy cake! Bookmarked this! You have a lovely blog! Thnks Beulah Arun for ur kind words ! Thnks Nayna Kanabar ... I had plans of making handvo but then plans changed and ended up making this itself ! Yummy and healthy bake! 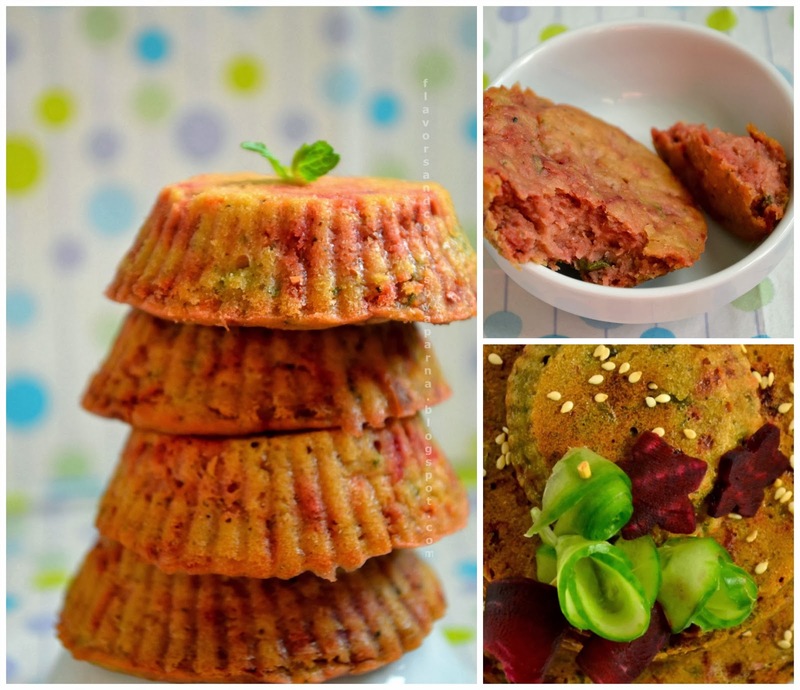 Nice recipe and lovely clicks! Thanks for sending this across Aparna .Looks so good!